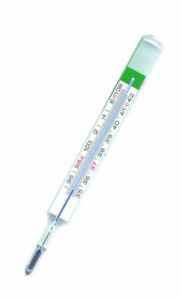 Measure your baby's temperature safely by using the waterproof 0.35 pound Geratherm clinical thermometer. Its dual scale makes it easy to read in the format that suits you best. This unique analogue thermometer uses Galinstan and is the only one in the world without poisonous mercury. It is accurate to +0.1 �C and -0.15 �C. Clean it easily by disinfecting the glass surface and keep it protected in its storage case.